A Dungannon woman who lied to police, attributing homophobic remarks to then Health Minister Jim Wells in order “to get” him, was jailed for three months today. Jailing a shocked-looking 49-year-old Dorothy Gardner at Downpatrick Magistrates’ Court, Deputy District Judge Neil Rafferty said he had “thought long and hard” whether he could suspend the jail term but that “because of the aggravating features that I have outlined, I do not think it would be appropriate in this case to suspend the sentence”. Moments later, however, following an application by defence barrister Noel Dillon, the judge released Gardner on her own bail of £250 pending an appeal against the jail sentence. Speaking outside court, South Down DUP MLA Mr Wells said he had no sympathy for the mother-of-one. “No, I don’t [feel sorry for her],” said the DUP politician. “I feel totally vindicated. Giving his reaction to the jail term, Mr Wells said he was “surprised” at the custodial term but revealed he had “asked that an example be made of this lady”. Minutes before her trial was set to start in July, Gardner, from the Killycanavan Road, admitted wasting police time by making a false report of a crime on April 28 last year. 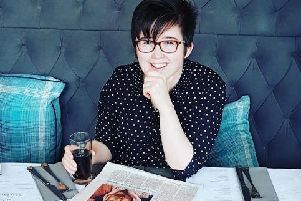 She had claimed in a police statement that she had attended a hustings event in Downpatrick and that Mr Wells had told the audience he believed treatment to HIV patients should be stopped. Prosecuting lawyer Samuel Magee outlined how she further claimed Mr Wells had made homophobic statements during the hustings event. There was uproar following the event when Mr Wells, who was Stormont Health Minister at the time, was wrongly reported to have made homophobic comments criticising gay parents. Although a transcript later proved he had not made the allegations, the incident contributed to him losing his job several days later. Gardner made a formal complaint to police after the hustings which included a statement claiming she had been at the event and heard the remarks. A police investigation later cleared Mr Wells and concluded Gardner had not been present at the hustings. Gardner also alleged in her six-page statement that she had been visiting a gay couple in Rathfriland when, coincidentally, Mr Wells called at the door during canvassing for the election and that she confronted him then. Mr Magee told the court, however, that police investigations and statements proved that Gardner was lying as she had not been at the hustings event and didn’t even know the lesbian couple in Rathfriland.